Recent release “The Snoring Couch” from Page Publishing author Andrea Mazzelladibosco is an animated and vividly illustrated journey into the family and life of the author. Read and laugh along as one pot of spaghetti causes a whole household to snore. Andrea Mazzelladibosco, a native Italian, father, husband, family-man, devoted writer and author, has completed his new book, “The Snoring Couch”: a fun and amusing story that reflects the author, his children and wife as they learn an important lesson about spaghetti and a snoring couch! Published by New York City-based Page Publishing, Andrea Mazzelladibosco’s creatively crafted book will be loved by children and adults alike! “’The Snoring Couch’ was written by me so that all who read it can be part of my family with all my children on a typical day. It shows what goes on in a working family’s life when the children participate with the parents in the kitchen and the television room after a day at school and work. I hope this book somehow connects with some families besides just mine and brings them a little joy no matter how hard or easy their life is or was. We all have to remember that the family is where all good things are taught to our children,” said author Andrea Mazzelladibosco. 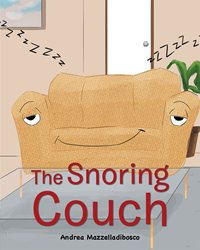 Readers who wish to experience this vibrant work can purchase “The Snoring Couch” at bookstores everywhere, or online at the Apple iTunes store, Amazon, Google Play or Barnes and Noble.